Playgrounds are very interesting places. They are a central part of our communities, they bring people together, and most of all they give kids a place to be kids. 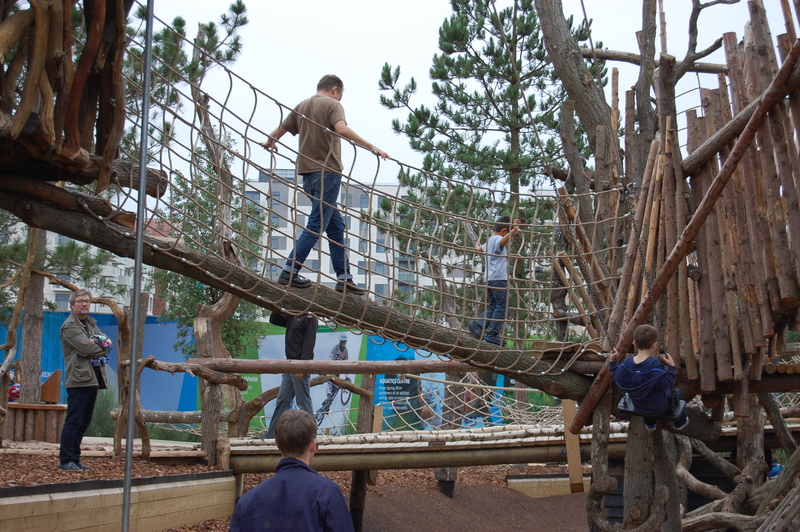 Here is a list of the most fascinating playgrounds from around the world. The Kamalani playground has a lot going for it. For starters it's right on the beach and tucked into the beautiful landscape of Kauai Island. It looks like a lost city waiting to be explored with loads of maze-like twists and turns for hours of beach adventuring. There are also several local artwork installations throughout the playground further adding to it's personality. This playground is unique on its own but the thing that makes it exceptional is the way that it seamlessly fits into the landscape and becomes a part of the much larger natural "playground." The heart and soul of the Pod Playground are the giant acorn "pods" that make-up the main structure, all connected by various slides and tunnels. It's almost like the natural world exploded into a much larger scale allowing kids to spend the day discovering it. Prince William and Kate even paid the playground a visit during their trip to Australia in 2014. If it's good enough for British Royalty, then it's gotta be good enough for the list. 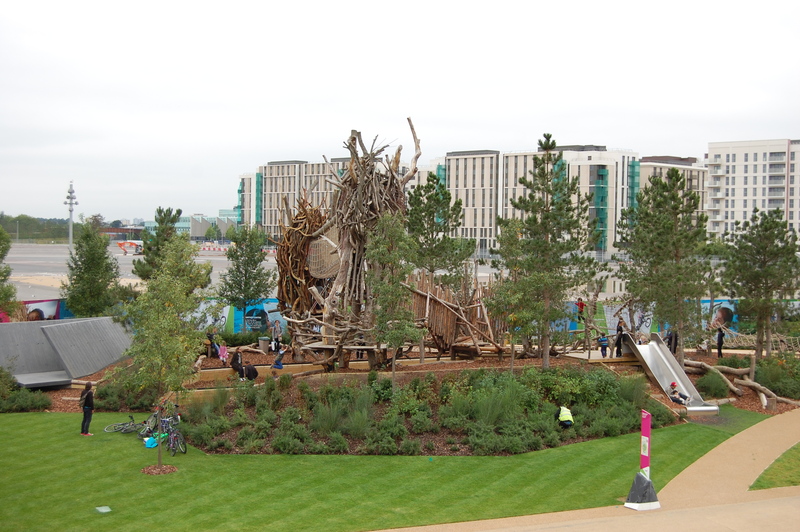 The Tumbling Bay playground is located near the Olympic Park in London where the 2012 Summer Olympics were held. Pictured here is the Scots Pine Woodland structure which is a woodsy-feeling playground that looks like it grew right out of the landscape. It's not the clean-cut playground that many of use are used to; it's a natural playground that allows kids to experience the concept of risk as they play. 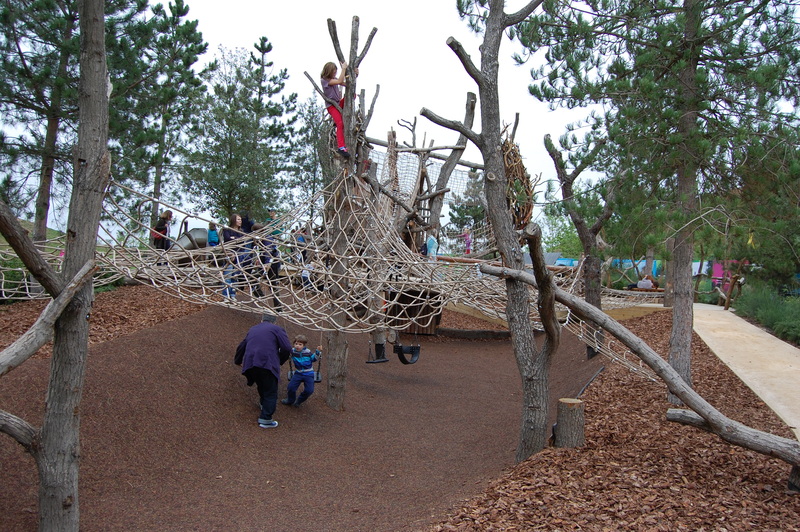 This beautiful meld of landscape and play was created by a world-class team of designers and builders with the play design by Erect Architecture, the landscape by LUC, and the specialty build by Adventure Playground Engineers. The Woods of Net is essentially a functional work of art. It's a part of the Hakone Open-Air Museum and feels like you're climbing around in the middle of a giant Lincoln Log paradise. It's a masterpiece created by Toshiko Horiuchi who actually hand-knitted the massive net structure inside the dome. Kids can climb up higher and higher through the worm holes in the net or swing around on the buoy balls. There is really nothing else like it. This is the only traditional "deck and post" playground that we have on the list but man.... IT. IS. MASSIVE. It's basically a play metropolis that sits right on the Ohio River in downtown Owensboro, Kentucky. There are several fountains and waterfalls as well as lots of open space to relax and take it all in. Because it's on the Riverfront, there are lots of local eateries and other things to do and see in the area. The St. Louis City Museum is kind of hard to describe. It's a playground but it's not really a playground all at once. We think if you put a museum and a playground in a blender, what you would wind up with would be something kind of like the City Museum. The outside area is probably what most people thing of as most resemblant of a playground, but really the whole thing is very interactive. There are loads of things to crawl through, climb up, jump off of... you get the idea. The folks of St. Louis are extremely proud of the City Museum and rightfully so. If you're in the area and thinking of visiting the Arch, you should add the City Museum to that list also. The concept behind Kolle 37 is fascinating and something that most of us aren't familiar with. 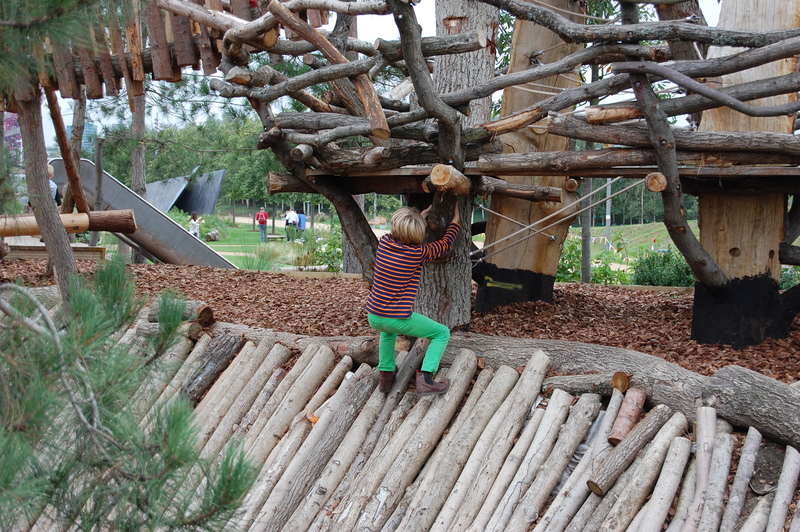 It's basically a playground that is continually evolving and being built by the kids that visit. Kids can go there just to play or they can work and build with tools and supplies provided by the playground. They have the opportunity to build huts, build fire, work with animals, or work in the garden. There are a few teachers and craftsmen that work there to keep an eye on things and provide direction to the kids but other adults really aren't supposed to be there. It's a very unique place that challenges the notion of what a playground can be.